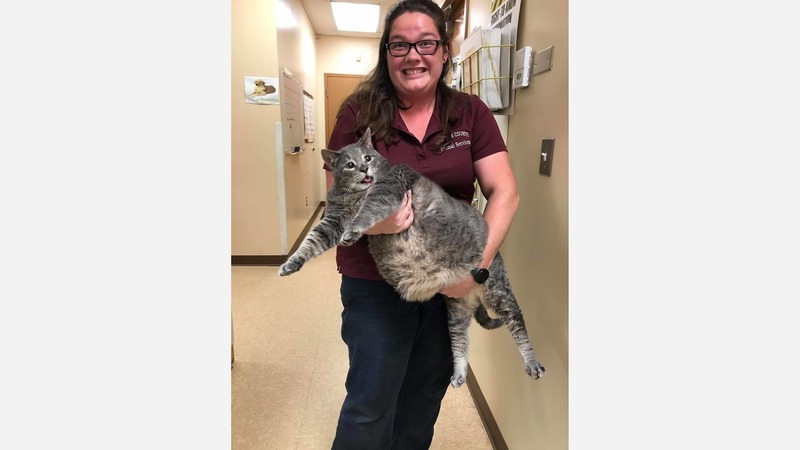 CHATHAM COUNTY, NC (WTVD) -- Dozens of people have reached out to the Chatham County Animal Shelter hoping to adopt a 31.4 pound stray cat. The shelter was unable to find a chip on the grey, neutered, male cat, and if he isn't claimed by an owner he will be up for adoption on Monday. Chatham County Animal Shelter tells ABC11 that they're changing the adoption process for the animal. The animal shelter is still considering how they will determine who the right family will be. The cat is facing considerable health issues due to his weight, and they've received more interest in this cat than probably any other animal they've had before. "The adopter will also need to sign a document stating they understand that he will need some pretty extensive vet care: exam, blood work, vet prescribed diet plan, etc. none of these things are cheap and we need to ensure his new family are willing and able to give him that," the post read. While Chatham County Animal Shelter's original post was shared over 12,000 times, they've taken to the comments section to remind everyone: "This is ONE cat out of the THOUSANDS that enter our shelter every year!" For now, the big guy is making himself comfortable in a breakroom cabinet - too big to fit into a normal-sized kennel.